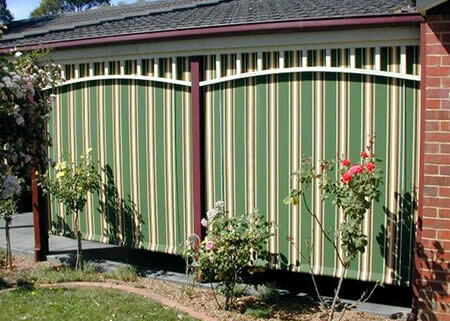 The Straight Drop Verandah Blind is another simple traditional type of external blind. Retracted by rope and pulley and extended by gravity. It has no arms and when fully extended it is held down by straps to prevent it swinging in the wind. When the rope is pulled to retract the blind, the fabric rolls around a tube at the base of the blind. 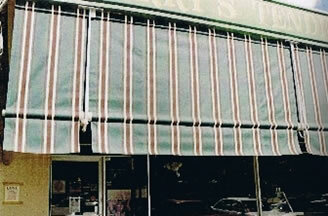 The Straight Drop Verandah Blind is ideal to use where it is not possible to fit arms for a standard awning i.e. on the edge of a pergola especially where the top fixing position slopes from one side to the other. Its main function is to protect against low sun angles i.e. east or west facing and also as a privacy screen. 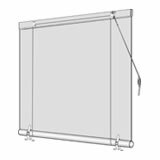 A variation of the Straight Drop Verandah Blind is the Clear PVC Blind. 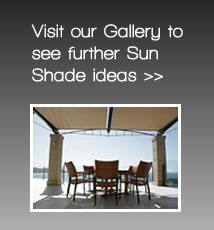 It is best used to keep alfresco dining areas warm in winter and dry in rainy periods. PVC is also available in a range of colours, although clear is most popular as it retains a view of the outside. 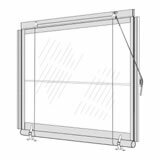 The Clear PVC Straight Drop is popular as a wind break in the alfresco dining areas of restaurants and verandahs where it is often fitted with zips each side. Another variation of the Straight Drop Verandah Blind is the Shop Blind which hangs down from the edge of the metal awning and is contained by “J” hooks.